Near Cafe Nation, E and I stop and laugh at the sign in the corner grocery store window. 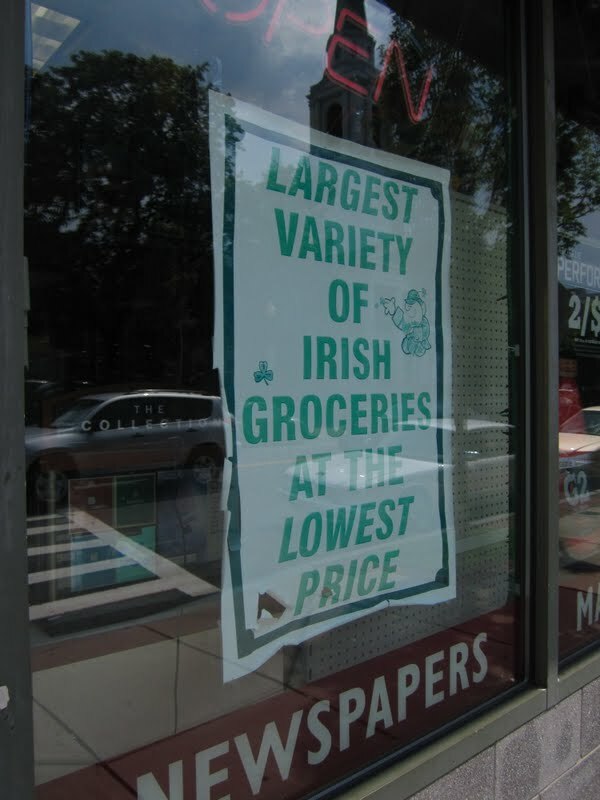 What are Irish groceries, anyway? E guesses soda bread. I guess Irish butter. 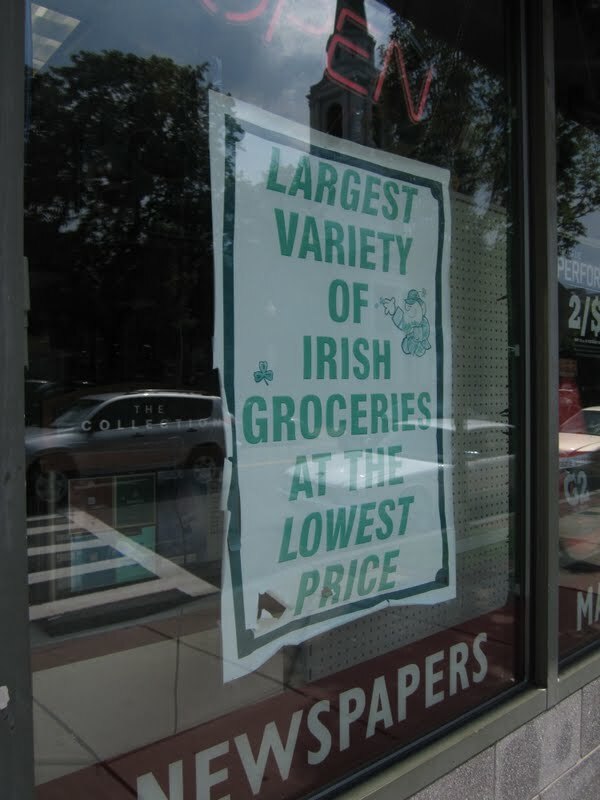 Then I remember that Brighton Center used to have a strong Irish community. So the sign makes sense. And my next question is -- where did the Irish go? E tells me that East Boston used to be Italian. She estimates it's now 60% Hispanic. And the last vestiges of the Italian community are Santarpio's and Rino's. Where did the Italians go? And the North End? Sure, it's still Italian. But the percentage is falling fast. 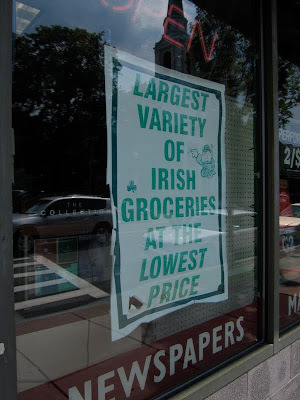 I wonder how long Southie will still be Irish. According to Stuff Magazine's Hot 100 list (July 26-August 8, 2011 edition), the Seaport District is the "Hot Summer Hangout." And, deeper into Southie, Local 149 recently opened. It tries very hard to call itself "a neighborhood joint." But there's whipped goat cheese and caramelized onion marmalade on the menu. So, I'm not really sure how "neighborhood" it is. But maybe it fits in with the neighborhood-to-be... Southie a few years from now. And, once again, Boston is hopeful that Downtown Crossing is making a comeback. The reinvention of neighborhoods is fascinating to me. There are neighborhoods that have retained their historic names, but really have little social fabric. The West End can't really be called a neighborhood, can it? The neighborhood that was there was demolished in the 1950's. It's now a sea of concrete: MGH buildings, high-rise apartment buildings, and low, stocky bunkers. I love the palpable identity of streets, neighborhoods, and cross-sections and how that identity shapes what we do and how we live. Activity in the Financial District follows the rhythm of the workday closely.... busy at 6pm, empty at 8. As you take the Red Line out towards Davis Square, you'll see more and more plaid -- The hipsters have moved in. Expect lines for brunch on Beacon Hill's Charles Street. and in the South End. When the weather is nice, there's people-watching on Newbury Street and sun-bathing on the Greenway. If you're taking the Green Line on a game night, at least one tourist will ask you whether to get off at Kenmore or Fenway. Don't make the mistake of shopping at Whole Foods on Cambridge Street at noon -- that's when all of the MGH doctors go to lunch. And, if you're into cannoli, you have to pick a side: Modern Pastry or Mike's. I've lived all over the country and all over this city. My friends are spread out in every direction, on every line of the T.
And what I'm looking for is a neighborhood to ground me.